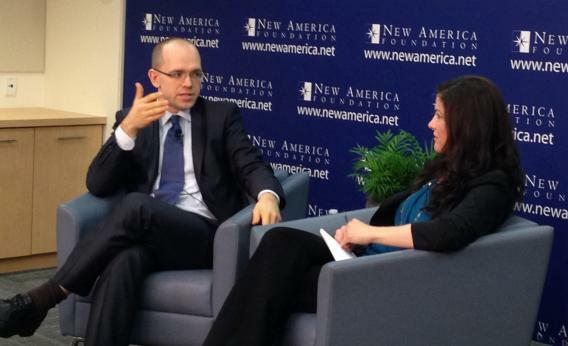 Evgeny Morozov discusses To Save Everything, Click Here at Future Tense event. Evgeny Morozov and Christine Rosen discuss To Save Everything, Click Here. Photo by Eliza French/New America Foundation. Watch a TED talk, listen to the breathless founder of a startup with an “-ly” suffix, or spend a few days touring Silicon Valley, and you’ll likely come to one conclusion: The Internet is akin to religion. It offers solutions to our problems and can comfort and guide us. Its founding fathers and patron saints should be revered. Morozov’s job, as he sees it, is not to annihilate the technology religion altogether, but to ensure that it gets prodded, poked, and exposed as fallible. He bared some of those fallacies—and was exposed, by the audience, for his own foibles—during a wide-ranging conversation moderated by New America Bernard L. Schwartz Fellow Christine Rosen, a senior editor at the New Atlantis. Take crime, for instance. Sensors and interactive screens that monitor public spaces are multiplying—and could conceivably make committing crimes impossible. But is that a good thing? “Allowing for crime to happen also allows for civil disobedience,” Morozov said. Committing crime sparks public debate. Breaking laws prompts us to question whether rules are still fair. Here, the takeaway is not that we should all be committing more crimes, Morozov clarified. Rather, it’s that deviance can lead to progress. And so can more intelligently designed gadgets and consumer products, he argued. Part of his book outlines different theories of design, and how designers can provoke and nudge users to think about their behavioral choices. One theory, adversarial design, is different—and superior, he suggested—to the behavioral “nudge” that seeks a particular kind of social intervention. He offered one example, a cafeteria, to illustrate the difference. A cafeteria designer could decide to feature vegetables at the front of the line, encouraging patrons to scoop broccoli before macaroni and cheese. This is a behavioral nudge. A cafeteria that hides all of the food and plates, on the other hand, is based on adversarial design. This layout, the theory posits, forces consumers to make their own decisions about which food to take first. How does that apply to gadgets? Information—on your iPhone, laptop, iPad—is constantly hidden and displayed for us. Browsers, for example, are designed to conceal certain things, like which companies draw personal data from you when you visit a website. What if Firefox documented the data you’ve oozed that day along with your browsing history? But while Morozov may deride technocrats and large, sprawling technology companies that claim to rid the world of evil, he’s generally pro-institution. In fact, one of his biggest tech gripes is the “hacking” movement—something he describes as puzzling and “anti-modern.” He challenged the notion of “ hackability” in a response to an audience member query about developing tools to secure an individual’s privacy online. For Morozov’s critics, like Wikipedia co-founder Jimmy Wales, that line sums up Morozov’s oeuvre: Morozov is the reigning critic king, but does he have any better ideas? What’s he going to do counter the simplistic solutions—and overall mentality—he skewers in his book? Rosen circled a similar issue earlier in the conversation. How do you inspire designers to think about political issues inherent in their designs at an earlier stage, given that they have a bottom line? she asked. And how does Morozov think technology companies should proceed with smarter product design? In other words, how will he translate his criticism into action? “We can’t say [Silicon Valley is] messing up and not give guidelines,” Rosen charged. For more on To Save Everything, Click Here, read Morozov’s Slate dialogue with Farhad Manjoo.